Fair play gives sport the character of beauty. 'Fair play is an essential part of sport' says Dr Alois Hechenberger, professor of sports games at the University of Innsbruck and developer of various team building activities. Lindsey Vonn is one of the Youth Olympic Games Ambassadors whose task is to share her valuable experience with and encourage the young athletes participating at the inaugural Winter Youth Olympics. Lindsey has won three consecutive overall World Cup and downhill championships (2008, 2009, 2010) and won the gold medal in downhill at the 2010 Winter Olympics in Vancouver. 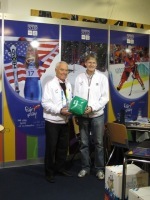 She is very enthusiastic about her mission and supports the up-and-coming young ski stars wholeheartedly. 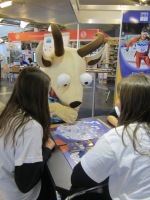 Yoggl is the official mascot of the Innsbruck 2012 1st Winter Youth Olympic Games. He is a chamois which lives in the steep and rocky mountains surrounding Innsbruck. His name is a short form for Jakob, 'Joggl', which is very common in Tyrol. Additionally, Yoggl is the compound of this nickname and the acronym of the Youth Olympic Games, YOG. INNSBRUCK, January 18,2012 - IOC President Jacques Rogge has rejected accusations that the Olympic movement has dragged its feet before the arrival of the rival X Games. "We did not wait for the X Games to start thinking about that." he said. "We organised the very first Youth Olympic festival in Brussels back in 1991, some time before the Olympic Games. I am not ashamed to say that we did learn a lot from the quality of the event. We applaud the X Games, it is a very good organisation and part of the spirit is in the youth Olympics because that is what young people want."